The tears have been shed, the breathing has stopped being so shallow, the questions have been answered, yet the memories remain. Remain they will forever, but it’s time for the next chapter in the history of Blackpool Football Club. Whatever happens from here, hindsight is showing that perhaps the departure of Ian Holloway was the right thing at the right time for both parties. Now the dust has settled it’s a good time to look behind the change to see why it happened and what challenges await Michael Appleton. Speculation had persisted for a few weeks, however, very few thought that the job at Crystal Palace would be the post that saw Holloway depart. Palace sold him a vision and gave him the right indications that they could match his ambitions as well as giving him a contract that was more agreeable with him. Holloway’s interview prior to his final game in charge consisted of his usual monologues, rambles if you like, where he made point after point with his usual mixture of passion, veiled anger, humour and intelligence. However, the enthusiasm wasn’t quite there, the eyes weren’t as bright, but the points he made were insightful and on reflection his departure was never really a shock if you looked deep enough. In paraphrasing Giovanni Trapattoni Holloway made his point with aplomb showing that he was very aware of the need to change something at the football club. In the monologue leading up to the above quote he talked about how he was worried about not getting in the playoff final this season and being conscious of wanting to move forward. He spoke about fans getting used to his style, substitutions and getting so used to it that they’ll want a different voice. Results had started to dip, the team had stuttered after a wonderful start. His heart had gone out of the job and the comments now coming from players suggest that things hadn’t been right for a while, but more on that later. After his departure Holloway talked about not having the energy to carry on with the job at Blackpool and that’s not surprising really. His natural energy is infectious, but all too often (football matches aside) that energy was being drained away in dealing with events off the field. The fine for changing his side in the Premier League against Aston Villa and the subsequent resignation offer, the Charlie Adam transfer saga dragging on for months, the loss and subsequent regain of key players who felt their contracts weren’t commensurate with their standing, the director remuneration of £11 million creating headlines for all the wrong reasons, the constant contract refusals of his key transfer targets after bids had been accepted. These aren’t necessarily episodes that are particularly unique to Blackpool, apart from the penultimate one and nor is it a definitive list. It was more the accumulation of these episodes, added to the fact that Holloway was often left to face the media time and again and pick up the pieces. Other more structured clubs would have done this for him, managed it better or deflected in some way. That wasn’t to be the case and all of this drained his energy, his hunger, his passion. 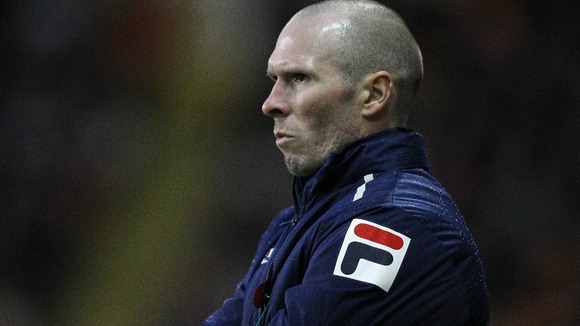 Now that the change has taken place, Michael Appleton comes in and takes over a good squad but with challenges. The underlying issues of the club culture will remain, but a new face can freshen things up and take an objective view on matters and make new plans. It’s hard to judge Appleton has a manager, coach and tactician given the constraints on his role at Portsmouth so it would be hard to make judgements based on his experience there. However, it’s clear from his first few weeks that he is organised, focused and has clear ideas about what he wants to do. This fits in well with the idea of the previous manager losing his passion for the challenge and gives an understanding of why Blackpool didn’t seem to have answers in games such as Huddersfield and Charlton at home when their play wasn’t as vibrant as it once was. Alongside this, Appleton’s first post match interview pretty much summed up where he felt he could influence things. The two key elements from that game he highlighted were the team shape and their fitness levels. This theme has continued almost every time Appleton has faced the press and arguably these two elements go hand in hand. Players need to be very fit to attack aggressively throughout a match and then regain their shape. He will have the data around their fitness levels which will no doubt be backing up his assertions and it doesn’t take a genius to realise that Blackpool games do get stretched in the final quarter. Under Holloway Blackpool’s balance was arguably an issue as he wanted his team to attack from the first to the last minute, however, the stamina needed to recover their shape after losing the ball wasn’t always there and that’s why games became stretched. Arguably in the Championship this isn’t a bad method as teams are a little less ruthless, however, it was in the Premier League when this was really an issue as teams frequently came from behind to take points off Blackpool in the last quarter of matches. This isn’t a slight on Holloway, Appleton is keen to appreciate that the attacking side of the team is exceptionally potent, his real challenge will be to bring up fitness levels while stopping game becoming too open, whilst not losing any attacking threat. Over the coming months it would be no surprise to see Blackpool sit a little deeper away from home, rather than trying to dominate possession as they tried to do under Holloway. It’s likely that the extra fitness (if gained) will allow Blackpool to attack and then drop in quickly behind the ball to recover a shape that may see more men behind the ball closing out gaps in the defensive line. Often when Blackpool’s full backs attacked the team would be out of balance with eight players in offensive movements. It’s likely that the full backs will sit a little deeper now and narrower giving the defence a more recognisable back four. There are other tasks ahead of Appleton, mainly housekeeping issues around discipline and cutting the squad size. However, these aren’t huge issues and given that over thirty players are due for some form of contract change come the summer it will certainly be a different club at the start of next season. Everyone has to change at some point and it can be difficult. The sounds coming out of the club at the moment appear positive, it’s too early to understand if players are ‘on message’ or if they’ve totally bought in to the ideas that Appleton has outlined. Games will be assessed and the results come along. If by Christmas Blackpool are in touch with the play offs then Appleton’s first phase will have passed off smoothly. How he builds on that will be very interesting to see. By no means is this a final assessment of Holloway’s time in charge, over time more detailed analysis will be compiled as will compare and contrast pieces as the Appleton regime takes hold. Holloway was a revelation at Bloomfield Road, he brought success that was never really dreamed of before. He is a high quality manager and he will find success elsewhere and he will never be forgotten for what he achieved. As for Appleton, only time will tell. Ian Holloway oversaw a hugely successful period during his time as manager, leading Blackpool to their highest league position in a generation. Each season had its ups and downs and was never less than entertaining. A series of posts analysing Holloway’s tenure begins with a summary of each of his seasons in charge.